August | 2014 | Oh Happy Dae! 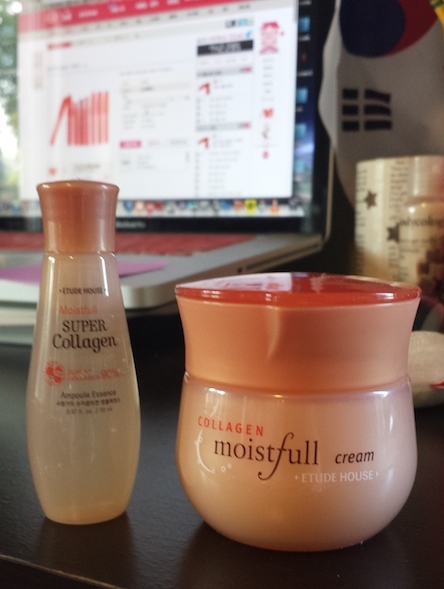 A friend of my mom’s friend went to Korea recently, and was very kind to pick up some items I wanted from Etude House. I’m a sucker for Etude House. Everything’s so cute! So I decided to show what I got and review a few items I haven’t shown you yet. 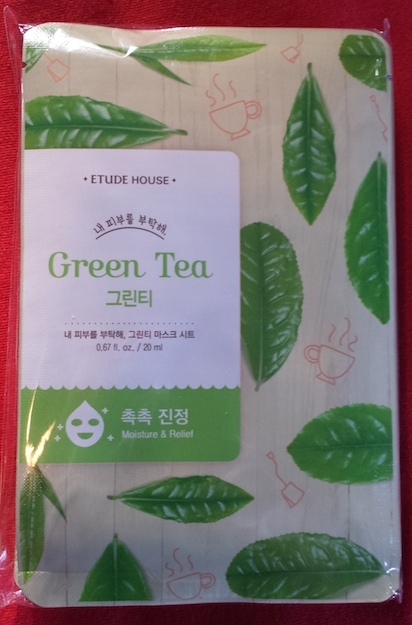 I really fell in love with the mask sheets at Korean make-up stores. They range from about 950 won to about 2,000 won depending on which kind you get. These particular ones are 950 won a piece, but they sometimes sell them in packs of 5 or 10 for a slight discount. Green tea is supposed to “provid[e] moist and comforting relief to sooth out rough and irritated skin”. I generally go for masks that have moisture, vitamins, or are supposed to sooth skin. Other masks may have whitening properties or other such things. I love this cream. I used it daily as my moisturizer after showers or washing my face. The pot may seem smallish but a little goes a long way. It goes on easy and I feel like my skin is smoother/softer when I use it. The bottle of essence it an extra that comes with it. There’s other parts of the Moistfull line like toner, night mask, eye cream, etc. I usually keep it simple with just the cream and essence though. Oh, BB cream, where would I be without you? I didn’t really know about it until I moved to Korea and now I don’t want to live without it! I was a little wary of buying this one because I didn’t like the previous BB cream I had gotten from Etude House, but also because I couldn’t see this in person. I was buying it for the heck of it. But all turned out well! First off, the consistency is nice — it’s not too stiff or too watery. There is a bit of a scent, but I didn’t notice it once I was applying it. Although this cream boasts brightening I didn’t feel like it made me too white. Another great thing about this BB cream is that it also is SPF30 so I don’t worry about sun lotion unless I’m at the beach or something. This particular shade is W13 Natural Beige (내추롤 베이지) and costs 15,000 won on Etude’s website. You can also find it on Gmarket. Yes! They had my favorite Disney princess! (Even though she’s not pictured on any of the stuff but whatever!) Again, I’m a sucker for cute packaging. 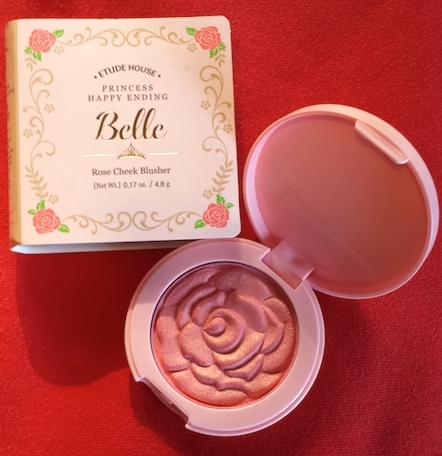 Plus I kinda needed/wanted a new blush anyway since I’ve had the same one forever. Anyway ~ this was another pleasing purchase. The color turned out nice — not too bright, but it does give my skin a nice glow. It’s small enough to fit nicely in my bag, make-up pouch, or even pocket if I wanted to. This shade is #2 Coral Rose. You can find it on Gmarket. These are products I already had, but wanted to show. 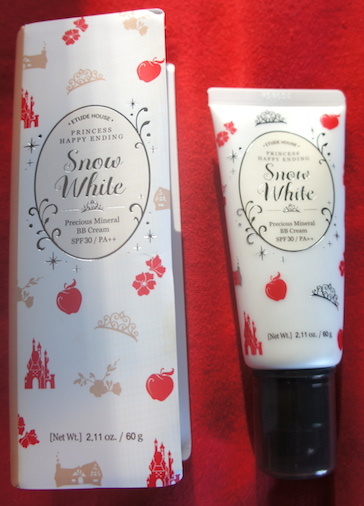 I originally wanted to get one of the Princess lipsticks, but the store was sold out. First, I have the Miss Tangerine Sweet Shower Lip Gloss. This is, unfortunately, now a retired item (sorry!). This was a product that Dara from 2NE1 endorsed some time ago. I picked it up because I trusted the sales person, but I don’t really think this is the right color for me. It’s a very bold orange color which is not something I normally use. If I dab off a bit it’s not too bad, but it’s rare that I use it. The Apricot Stick Lip Gloss, however, is quite nice! It’s a nice shade of pink with a dab of red. It doesn’t go on too dark, and the size and weight is nice for carrying around. This shade is #3 Fresh Apple (3호 상금 사과). Oh, Etude House, how I love thee! Granted, shipping overseas is going to bring up the prices quite a bit, but I really do like a lot of their products. I got lucky that someone was able to pick them up for me. I hope you found my review useful. Feel free to send me any questions you may have about these products or Korean make-up in general. I’ll do my best to find the answers.